"È da 8 e Kimi lo stimolerà"
El reinado de Fernando Alonso como guía indiscutible de Ferrari ha terminado, por lo menos según el presidente de Ferrari, Luca Montezemolo. Kimi Raikkonen estará a su lado, el finlandés, que fue el último piloto que gano con Ferrari el campeonato de 2007. "No me gusta hablar de n. 1 y n. 2", dijo Montezemolo en una entrevista con CNN antes del Gran Premio de Brasil, el último de la temporada. El presidente de Ferrari alabó la capacidad de Alonso, dando al piloto asturiano de 32 años de edad, una "nota de 8" para la temporada 2013, que lo llevó a luchar mucho contra la abrumadora Red Bull de Sebastian Vettel Montezemolo dice , sin embargo, que la llegada de Raikkonen estimulará a Alonso hacerlo aún mejor en 2014. "Fernando es un muy buen piloto." Estoy muy feliz de tenerlo en el equipo. Sólo estoy frustrado de que no estuvimos en condiciones de darle un coche un verdaderamente competitivo en las últimas temporadas. " Alonso . "Alonso sabe que tiene que dar su mejor esfuerzo para ganar no solo para sí mismo, sino también para Ferrari . Creo que es también de interés para Alonso tener un compañero listo para competir contra los mismos rivales ". Raikkonen: "Necesitamos un piloto capaz de ganar carreras, o al menos tomar medidas contra nuestros principales competidores Creo que va a ser capaz de hacerlo.". También el año próximo con nuevas reglas y con un coche completamente nuevo que se desarrollara sin el coche del año pasado,tenemos la necesidad de un piloto experto. No olvidemos que Kimi es el último piloto que ha ganado el campeonato del mundo con Ferrari." Yo sigo convencido de que si el año que viene el coche no va muy bien, es el definitivo. Read: "Alonso's season? An eight out of 10"
Mugello (CNN) -- Fernando Alonso's reign as the undisputed No. 1 driver at Ferrari is over, according to Ferrari chairman Luca di Montemolo. The double world champion will be partnered at the Italian team in 2014 by Kimi Raikkonen, the Finn who won the last of Ferrari's 15 world championships in 2007. "I don't like No. 1, No. 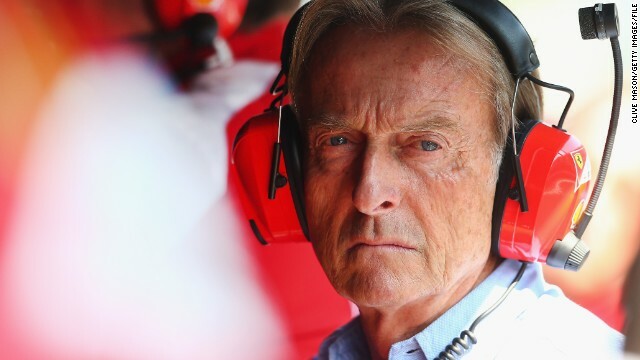 2," Di Montezemolo told CNN ahead of this weekend's season-ending Brazilian Grand Prix. "No. 1 is the timing, No.1 and No.2 depends on the timing." "Fernando is really a very, very good driver," said Di Montezemolo. "I'm very pleased to have him in the team. I am only frustrated that we haven't been in condition to give really a super car in the last seasons. "Alonso knows that he drives to win for himself, but also for Ferrari. Ferrari is a team and I want drivers (who) will drive and will act and react as a team member, not only one man. "I think that both of these drivers have good experience ... I think it's also in the interest of Alonso to have in the team a driver ready to battle his own competitors, Alonso's competitors." Raikkonen has won 20 grands prix since making his F1 debut in 2001 and returns to Ferrari -- he drove for the Italian team between 2007 and 2009 -- as a replacement for Brazilian Felipe Massa, who is moving to Williams after eight years at the "Prancing Horse." Raikkonen has spent the last two years with Lotus, having left the sport in 2009 to pursue a career in rally driving. Di Montezemolo wanted to recruit a driver of Raikkonen's experience given the raft of new regulations set to shake up F1 in 2014. "I need a driver able to win races or at least to take off points from our main competitors," said Di Montezemolo of the 34-year-old. "I think he will be in condition to do it. "For a car with completely new rules, in which you have to develop without the previous year's car, you need a driver with experience. "Don't forget that Kimi was the driver that won our last world championship." However, doubts have been cast over Ferrari's ability to manage two drivers who will have their eyes set on a title challenge. Alonso famously clashed with Lewis Hamilton while at McLaren, a rivalry which culminated in the Spaniard joining Renault in 2009 before signing with Ferrari in 2010. But Di Montezemolo has no concerns of a similarly personality clash this time around. "I don't want to say that they are old..." Di Montezemolo joked when asked if the two drivers will get along. "But I'm sure, yes. "Si dice compiaciuto della passione di Alonso per la Ferrari ma "schierare una coppia Raikkonen-Alonso significherebbe volersi far male: io voglio due piloti equilibrati, che collaborino"
Cree que juntarles sería "hacernos daño a nosotros mismos". Considera necesario tener "dos pilotos equilibrados, que colaboren". Responsables de la Ferrari han desmentido el interés de la Scuderia por Kimi Räikkönen y afirman que solo se trata de “fantasías”. Que no os enteráis, no queremos coches tan buenos como el RedBull, con que sea un poquito mejor sobra.